The Tibbalds CampbellReith JV was appointed by Homes England in September 2017 to manage building demolition, formulate redevelopment proposals and submit an outline planning application for the 0.5-hectare former Magistrates Court site in Consett. Our team was initially tasked with procuring and managing the demolition of the existing court buildings to prepare the site for redevelopment. A full suite of pre-demolition surveys and assessments was required (including asbestos surveys and utilities disconnections) and relevant notices and planning permissions were obtained from the Local Planning Authority to facilitate demolition. We produced a full suite of documents for the Invitation to Tender package, in accordance with Homes England requirements, and issued this to interested contractors via the Contracts Finder web portal. We undertook a full appraisal of submitted tenders using Homes England financial criteria and our own qualitative and quantitative criteria to make an appointment recommendation to Homes England. The team also fulfilled the role of Principal Designer under the CDM 2015 Regulations. Our team was engaged to produce the Masterplan for the site and submit an outline planning application to support its sale to a local developer. We engaged with Durham County Council and undertook pre-application discussions to establish the level of supporting technical information required. Our team subsequently managed and undertook the necessary technical reports to support the planning application, including a land contamination assessment, Flood Risk Assessment, drainage strategies, Transport Assessment, coal mining risk assessment (as the site was within a high risk area), noise assessment, in addition to the Planning Statement, Design & Access Statement and ecological and arboricultural surveys and reports. 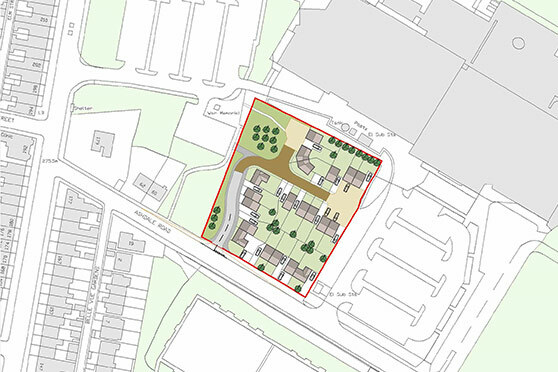 An outline planning application was submitted in December 2017 for the redevelopment of the site for 20 dwellings. Planning permission was granted at committee in March 2018 and we have subsequently supported Homes England on the wording of the S106 and likely S106 contributions to inform its viability assessment.